1. Elias William James: born February 11, 1837 in East Union, Coshocton County, Ohio; married May 26, 1870 or May 16, 1871 to Cornelia A. Denver (1841-1911), daughter of Patrick Denver and Mary Murphy; died May 3, 1904 (aged 67) in Coshocton County, Ohio; buried at Oak Ridge Cemetery, Coshocton County, Ohio; known children include: Mary D. James and Rosalie Telfair James. 2. Melvina Victoria James: born 1840 in Ohio; married Crispen Tredway, Jr. (1834-1895); died May 27, 1876 in Warsaw, Coshocton County, Ohio; buried at Blooming Grove Cemetery, Randle, Coshocton County, Ohio; known children include: Thomas F. Tredway, Clara Victoria Tredway, William Thomas Tredway, Joseph Fleming Tredway, Sadie Olive Tredway, Sarah Olive Tredway, Garret Emmet Tredway and Cora Iva Tredway. 3. James F. James: born circa 1840 in Ohio; married Martha F. Mcvey; died on January 27, 1888 in Ohio; known children include: Nancy C. James. 4. Rebecca J. James: born circa 1842; died circa 1888. 5. Rachel Victoria James: born circa 1845; died circa 1888. 6. Ruth Victoria James: born circa 1847; died circa 1888. 7. Nancy E. James: born circa 1850; died circa 1888. 8. Sarah K. James: born circa 1850; died circa 1888. Thomas James (1812-1889) was the son of Elias James, Jr. (1785-1860) and Nancy Fry (1785-1863) of Loudoun County, Virginia. 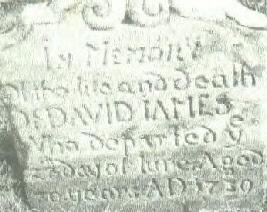 The inscription of the tombstone of Elias William James reads, “Capt. 32 Reg. CO K O.V.I./Born in Coshocton co. Feb 11, 1837/ Died in Coshocton May 3, 1904/ For More Than Three Years A Soldier In The War Of The Rebellion/ For More Than Six Years A Lawyer At the Coshocton Bar/ A Brave Soldier And Honorable Lawyer/ He Bowed Alone T Death/ At the Messengers of the Most High/ In Whose Mercy He Trusted/ Through the Means of the Great Advocate Jesus Christ. Dates of birth of children come from MyTrees.com in subfile Sarah Cochran Born 1815 in Ohio at www.mytrees.com. Find A Grave Memorial for Captain Elias William James (1837-1904), Memorial ID No. 96695955, created by Debe Clark, added September 7, 2012. Find A Grave Memorial for Melvina James Tredway (1840-1876), Memorial ID No. 49494275, created by Linda Randles, added March 9, 2010.